The Undebt.it blog always has the most up-to-date information on new features, useage tips and bug fixes. Use the blog categories & tags links to the right. Yes, this site will remain free as long as people want to use it. There is a premium account option, but you get plenty of features with the basic (free) version. You can visit the support the site page to see how you can help the site. Do I need an account to use the site? No, you don't need an account to use the site. 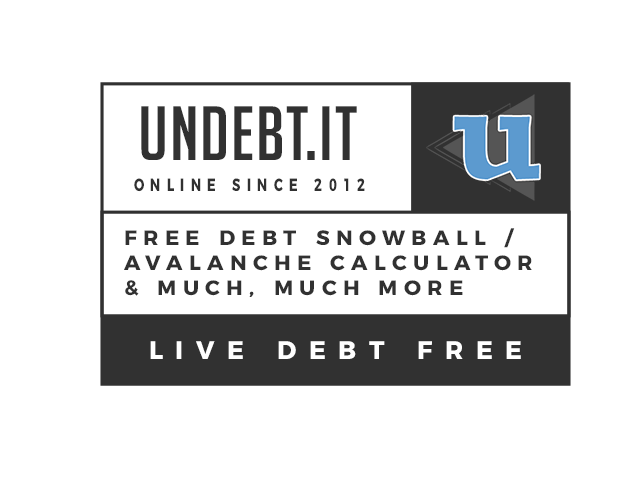 Check out the Debt Snowball Calculator page to get a payment plan without signing up for anything. There's also a demo account setup so you can take a test drive before signing up. How can I delete or reset my account? Go to the My Account page and you'll see a section where you can delete or reset your account. Deleting your account clears all of your information, while reseting your account just deletes the transactions and history. After confirming you want the account deleted, all of your info will be immediately deleted. I have an account that I pay bi-weekly. How do I deal with that? This site is based on accounts with monthly payments, but there is a way to workaround the problem. First, change the due date of the account to the end of the month. Record your payments as you normally would, but you'll have to override the payment amount. When you make payments, keep an eye on the due date. If your payments are over the minimum payment due amount, the due date will get bumped up to the next month; just go into the debt details page and change it back to the end of the current month. I'm concerned about security. How does this site protect my information? Is it possible to leave out a debt account from the payment plan without deleting it? Yes. Go to the debt details page for the debt account and uncheck the box labeled Include in payoff plan?. When you go to the Debt List page, you'll notice that the account will be labeled "excluded". How do I add more debt accounts? Go to the Debt List page. This page shows a list of all of your debt accounts and there is a form at the bottom for adding new accounts. Click on the name of the account in the list to get to the Debt Details page of the account. There is also a link to add new accounts on the left sidebar in the "My Debt Accounts" section. Is there an iOS/Android app available? No, unfortunately there is not. I don't have the resources to develop a mobile app at this time. However, the site has been designed to work very well on all mobile devices using a web browser. You can even make a shortcut on your phones' home screen: in iOS, open up the site using Safari and click on the share button (the square with the arrow pointing up) and click on the "add to home screen" button. An icon will be created that goes directly to Undebt.it. Can I connect my bank account like Mint does? No, unfortunately this will probably never happen. It is just me running this site and connecting third party banking information takes a tremendous amount of resources. You can however, use Undebt.it+ to sync with your YNAB account. It sounds like you either have your monthly budget set too high *or* you are joining mid way through a billing cycle and you have already paid some of your debt accounts for the month. Undebt.it will try and use all of your budget each month to pay down debt and if you have just created an account, the site doesn't know that you've already made payments. The best way to fix this is to record the payments you have made in the debt details page for each account. Just make sure you choose the current billing month when entering the payment amounts. As you record your payments, you will see the numbers change in the "Payments Made" box on the status bar across the top of the screen. Once all of your payments are recorded, your payment plan will be accurate. Here's a blog post that goes over the issue in more detail. How do I change the debt payoff method? You can change the payoff debt method in two different places. When you choose a new plan, everything is updated automatically for you and you can change it back any time you like. The first location you can find it is on the "my account" page. The other place is on the "debt snowball table" page. I encourage you to select different plans to see how your payoff date is changed. Of course, you can fine-tune your payoff plan with the custom payoff plans. I signed up for an account and added my debt info; what now? The two places you'll be spending the most time are the Dashboard and the Snowball Table page. The Dashboard is where you can keep track of your current accounts and record payments. The Snowball Table page shows you your entire payment plan from start to finish; it's like what you see on the Debt Snowball Calulator page. What's the difference between the "balance" and "highest balance" fields on the debt details page? The "balance" field refers to your current statement balance. The "high balance" can be your current balance too if you're just getting started. It can also be used to track existing payoff progress before signing up on the site. For example, let's say you have a credit card with a current balance of $1,000, but it got as high as $5,000 last year. You've been paying it down in the meantime and the current balance is down to $1,000. The high balance would be the $5,000 number. However, if you want to start the progress from scratch, just use your current balance as the high balance too. The highest balance is only used to track your overall payoff progress percentage. How do I add a new debt account? Go to My Debts > Debt List and scroll down to the bottom to the "Add New Debt Account" section. You can setup as many debt accounts as you like. What exactly does "billing month" refer too? You'll see the term "billing month" on the debt details page. It refers to the month in which the payment is due. It's possible that a payment is made at the end of the month, but the account's due date is in the following month. For example, if you have a debt that's due on June 6, the billing month is June (even if you pay it on May 31). How do I remove one or more debt accounts? Go to the Debt Details page for the account (click on the account name on the Account List page). There is a "Delete Account" button at the bottom of the page. How is monthly interest accrual handled? Interest is automatically accrued (added to the balance of your account) once a month - you do not need to manually add the interest charges. The day of your account's due date is used as the accrual date. For example, if you have an account that is due on 3/29, the interest will be accrued every month on the 29th day. Undebt.it supports promo interest rates, so if you have your account set to be in a promo, then the promo interest rate is what will be used to calculate the current month's interest. There's also an area on the debt details page where you can see a history of the monthly interest charges. Note that your bank or lender may calculate interest differently, so it may be necessary to occasionally update your accounts balance manually. How do I use Debt Snowflakes? Debt Snowflakes are handled on the Additional Payments page. All you need to do is enter in the billing month and amount you plan to have extra. You can have more than one snowflake in a month if you like (they are added together). You can even have a negative snowball amount in a month if you know you're going to be short on a given month. Remember, snowflakes are an extra amount on top of your regular budget. Can I skip of month? Sure. What you would need to do is go to the Additional Payments (debt snowflake) page and create a snowflake with the negative amount for the month you need to skip. For example, if your current snowball amount is $250 but you know you won't be able to pay anything extra next month; create a snowflake for -250 for the month and your payment plan will be adjusted. Repeat as needed for each month you need to skip. I added another debt account and my total monthly budget went up. What happened? For Undebt.it to work correctly, you need to be able to at least pay the minimum amounts due on all of your accounts. Let's say you have a monthly budget of $1,000 and the total minimum payments due on your debt accounts is $900. Then you decide to add another debt account that has a $150 monthly payment. Undebt.it will automatically increase your budget to $1,050. If you are unable to pay the minimum amount due on an account, then you need to exclude it from the payment plan. There is a setting in My Account > Profile Settings called "Auto Budget Adjustment" where you can turn this off if you like. I have a student loan that's not due for another six months. How do I include it in my payoff plan? Undebt.it supports deferred due dates, so just add it in like any other debt account and choose the actual due date. Check out the Debt Snowball Table and you'll notice that there won't be any payments due on your student loan until the month when the payments are scheduled to kick in. One thing to remember is that the payments on the deferred loan will be automatically reallocated to other debt accounts until the payment is due. *Tip* If you have a deferred loan and you don't want the payment to be reallocated, create a negative amount debt snowball for each month you want to skip a payment. How do I sign up for Undebt.it+? How can I keep track of my monthly expenses, like cable and phone bills? Can I try out Undebt.it+ before buying to see if I like it? Absolutely. Just login to your account and go to the Undebt.it+ page and click on the button labeled Enable 30-Day Trial and you're good to go. There's no credit card required to try it out. If don't want to buy the membership, just let it expire in a month and there's nothing else you need to do. Go to the My Account page and then to the Undebt.it+ Membership tab. You'll see your order history as well as the date that your membership is good through. How do I use the Debt Blaster payoff plan? Go to the My Account page and select Debt Blaster from the debt payoff method list. Next, decide on if you would like to increase your budget by a percentage amount or a fixed amount. Your monthly budget will be automatically adjusted on the first day of every month. You can see your payoff plan on the Debt Snowball Table to see your new payoff plan. Are there ever any sales/promo codes? Yes, there usually are active promotions. Check Facebook and Twitter for active promotions - the links to both are in the page footer. Yes it does! You can sync your account balances automatically. Check out this blog post for directions and screenshots. No it does not renew automatically. You'll get an e-mail 10 days before the membership expires to remind you to renew your account. Don't forget to look for promo codes when you renew.